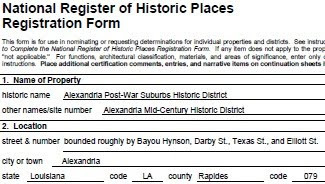 It's not post-war and it's not mid-century, but the Dairy Barn on the property of the Central Louisiana State Hospital overlooking Buhlow Lake is certainly worth saving. If you can attend this event, you are encouraged to register early as seating is limited. Doors will open at 6 p.m. and beverages and cheese will be served as folks gather. When – Tuesday, August 30 at 6:30 p.m.
Dave Curry and Nathan Martin of the Save the Dairy Barn at Buhlow Lake Committee will provide an informative program you don’t want to miss. 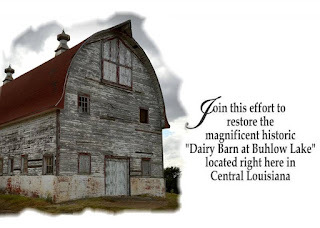 Most everyone in CENLA is aware of the old Dairy Barn, an historic icon atop the hill on the property of the Central Louisiana State Hospital overlooking Buhlow Lake in Pineville. But do you know the history of the barn, its current condition, progress, plans, and challenges to preserve it? What may be the future of the barn? Learn some answers and share dreams and ideas of what it could become.